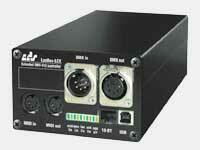 The Lanbox (*) is a device for controlling lights over DMX. The Lighting Assistant (or Lassi) is free software that helps in programming the Lanbox. It is intended to be used alongside the standard LCedit+ software that comes with the Lanbox. Lassi uses the ethernet connection to communnicate with the Lanbox (USB not supported). UDP messages sent out by the Lanbox are used to monitor the channel levels. TCP messages are used to send cue list information and commands to the Lanbox. The computer running the Lassi software can at the same time run LCEdit+. While editing cue lists, channels levels can be entered from a Lassi window. 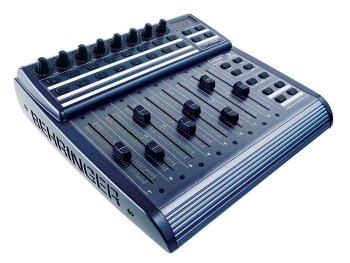 It is possible to use Lassi to record channel levels provided by a DMX control board that is connected to the Lanbox, or through a Midi Control surface, such as the Behringer BCF2000. The development of the predecessor of Lassi started out in 1998 as a hobby project to support the control of the lighting for the theatre group Pinokkelijn (Dutch). 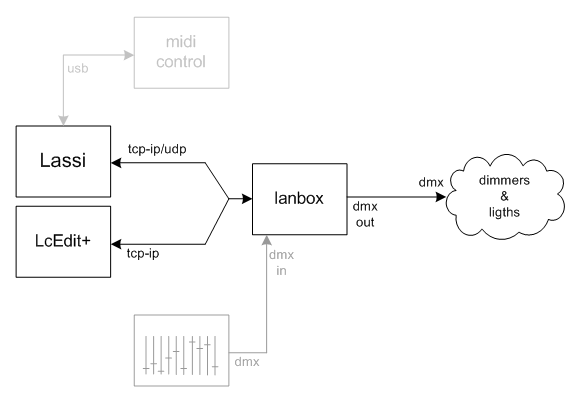 The original version of the software used a DMX Dongle from Artistic Licence. Working on and off during 2006, this software was adapted to use the Lanbox for DMX control instead. The idea was to really use the capabilities of the Lanbox (such as fading, running cue lists and chases), rather than using it merely as a kind of dongle. Lassi was used for the first time in a real live production of Woyzeck (Dutch) in March 2007, and has been successfully used on many other shows since then. Lassi is an open source project hosted at SourceForge. The software is written in Java. The user interface based on Java Swing technology. We are currently working on the integration of several of the excellent Swing components from JIDE Software. Lassi is also a traditional South Asian beverage, originally from Punjab, India/Pakistan, made by blending yogurt with water, salt, and spices until frothy. Lassis are enjoyed chilled as a hot-weather refreshment. Traditional lassi is salty and sometimes flavored with ground roasted cumin (Wikipedia). (*) Lanbox is a registered trademark of CDS advanced technology bv. www.lassi.be | www.lanbox.com | Lanbox © is a registered trademark of CDS advanced technology bv.